Wouldn’t it be cool to jam with a new gadget this summer? McDonald’s makes this dream come true with Summer Medley of Surprises – McDonald’s newest instant prize card promotion. 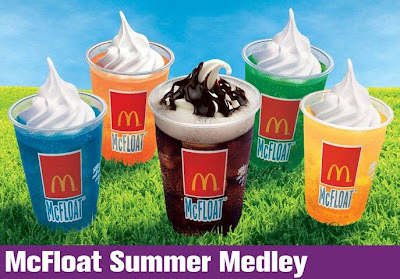 Until May 31, when you try any of McFloat Summer Medley’s yummy refreshing drinks – Blueberry Sprite McFloat, Coke McFloat, Four Seasons Sprite McFloat, Green Apple Sprite McFloat, or Honey Banana Sprite McFloat – at any McDonald’s store nationwide, you will get a promo card which gives you a chance to win a brand new Samsung Galaxy Tab 7.0 Plus. Aside from a Samsung Galaxy Tab 7.0 Plus, there are other awesome prizes that can be won via Summer Medley of Surprises: FREE Upsize to Large Soft Drink for any Medium Value Meal purchase, FREE juice Up for any Medium Value Meal purchase, FREE Upsize to Large Fries for any Medium Value Meal purchase, Double Cheeseburger with Regular Soft Drink for only P75, P20 OFF on a purchase of Big Mac a la carte, or P20 OFF on a purchase of a Quarter Pounder with Cheese a la carte. Each promo card is a definite winner! For more information, visit www.facebook.com/McDo.ph. Large float po ba or small?